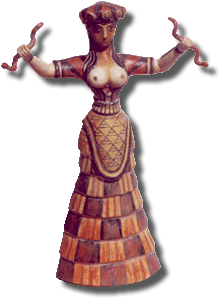 The Cretan Snake Goddess This image is an exact restored replica of the original Snake Goddess image found in Knossos, Crete, by Arthur Evans around the turn of the last century. The original was made of faience around 15 inches tall. There was a second figure, also of a snake goddess or perhaps a priestess, found together in an area of the excavation that Evans called the Triple Shrine. These images date from around 1500 BCE-just prior to the explosion of the volcano Thera and the subsequent earthquakes that wrecked the temple at Knossos. Also found with the image was a collection of small faience animals. Originally this image was erroneously reconstructed with one of the animals, a cat, perched on her hat. No one knows the name of this mysterious Goddess, for Cretan writing of this period is a form of hieratic that cannot be deciphered at this time. We are, of course, free to speculate; and there are many images of the primary dieties of Minoan Crete in the form of statues, frescoes, intaglio gold signets, ivory carvings, etc. From what we can piece together, the Minoans worshipped a holy family which consisted of a Mother, a Daughter and a Boy Child. The juxtaposition of this holy trinity is sometimes called a Kourotropos. This family is similar to the images we find in Neolithic Turkey at Catal Huyuk. The Great Mother characteristically is shown seated enthroned, the Maiden Daughter is usually standing, and the Son can be found in a variety of worshipful or playful poses. The Mother and Daughter duality found here and elsewhere in the old European/Mediterranean cultures are the prototype of the Demeter and Persephone archetype that was the foundational mythos of the Eleusinian Mysteries in the ancient classical world. They appear later in Greece as the classical Olympian family of Leto, Artemis and Apollo. The most archaic role of the Daughter Goddess is often chthonic in nature, and she appears not only with snakes, bees, butterflies and other animals in her aspect of Lady of the Beasts, but also with poppies or pomegranates as well. Her wasp-waisted bodice and beehive skirt are reminiscent of the cult of the Queen Bee and images of this Goddess are also associated with the symbol of the Labrys, the double axe that represents both the death-bringing implement itself, and the shape of the butterfly--which is symbolic of the resurrection of the soul. The Sacred Serpent was honored originally for its practical function as a rodent killer in graineries and beehives. Rather than the personifacation of evil, these sensuous creatures were seen in both positive and negative aspects: as healers, guardians, and messengers of the Gods on one hand; or as the bringer of retribution to the wrongdoer, on the other. The snakes she holds appear to be the poisonous Asp Viper (Vipera aspis). One relevant story that comes to us from ancient sources, and is attributed to Minoan Crete, is the tale of Britomartis "the shining maiden." Pursued by a satyr (or some say her brother), she leaps over a cliff to escape and is prevented from drowning by being caught up in the nets of a fisherman. She is transformed into an immortal and is henceforth called by the name Dictynna, which means "the netted one" (note the netlike apron on this figure). A variant of this tale is told in the story of Ariadne, the daughter of Queen Pasiphae, who flees the palace of Minos with her Greek lover, Theseus. He abandons her on the island of Naxos, and in grief she leaps into the sea only to be rescued in a net by none other than the God Dionysos, who claims her as a bride and as his chief Priestess. Perhaps this earlier tale could be a worn down fragment of some initiatory religious rite. Certainly the story of Ariadne and Dionysos formed part of the Dionysian rites as pictured in the famous frescoes of the Villa of the Mysteries in Pompeii. It seems likely that this standing image of the Goddess is a form of this cthonian Maiden who passes through death and is resurrected into immortality. Her name could be Ariadne, Britomartis, or even Dictynna. It appears that there was some tradition that a young woman risked death in childbirth to bring forth a new life out of the underworld, and became, in the process, a mother. Perhaps these ancient birthing rites and agricultural mysteries were the basis of Minoan religious practice. It is even unclear as to whether this image represents a Goddess or her Priestess. Yet it is likely, given a philosophy of immanent divinity, that this image captures her in the moment of epiphany: the instant in which transfiguration occurs and the mortal Priestess is transformed into the personification of the Living Goddess. This image was lovingly recreated by Oberon Zell for the Mythic Images collection. She is simply the most beautifully authentic reproduction of this image available in the world today. Nothing of this precision is available even from the Heracleon Museum on Crete. She is cast in durable waterproof polyresin, hand painted and then slightly aged to restore this piece to how she might have looked when she was sitting on an altar in the Triple Shine of the ancient Temple at Knossos in 1500 BCE.